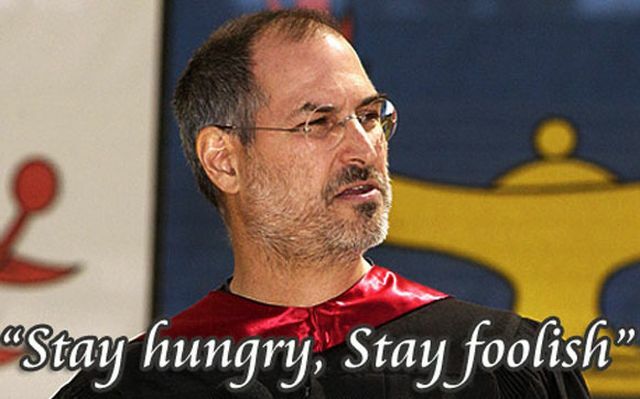 Stay Hungry, Stay Foolish | What is the Meaning & Purpose of Life? In his now famous commencement address to the Stanford University Class of 2005, Steve Jobs (CEO and founder of Apple and Pixar) recounted three anecdotes that meaningfully shaped the life of this renowned entrepreneur [and later found to be instrumental to one of the greatest success stories of mankind]. The paradox of this keynote speech to the graduating class of one the premier institutions of higher learning was palpable, as he began by pointing out his decision to drop out of college was “one of the best decisions I ever made“, that neither of his adoptive working class parents graduated from college, and that this particular occasion was “the closest I’ve ever gotten to a graduation“. The theme of his first story pertained to the notion of “connecting the dots” of past pursuits that satisfy your curiosity, following your intuition during your life’s journey and trusting things will work out in the end. In other words, since it is impossible to know what future opportunities will lie before you, if you pursue that which you are most passionate about, you will be better able to connect those meaningful experiences that dotted your past and assimilate them in a manner that will enable you to do things once thought unimaginable. His second point was about “love and loss“, where he forewarned about the danger of “just settling” in lieu of doing things that really get ones juices flowing. He likened his notorious set-back in getting fired from Apple in 1985 that served as “awful tasting medicine that the patient needed” in order to enter the most creative period of his life, find the love of his life to start a family with (his wife Maureen), and set the stage for his second renaissance at Apple in 1997. He suggested had he not always been doing what he loved most, getting hit with that once devastating brick of life’s setbacks, he would have never been able to recover and realize the wonderful things that later came to be. His third story was about death where he suggested what’s really important comes into focus in the face of death and the need to follow one’s heart and intuition. In recounting his first brush with death, he warned against: (1) living someone’s else’s life; (2) believing someone else’s dogma; and (3) allowing the noise of others’ opinions to drown out your inner voice. As a result, he rarely went about his day without thinking it might be his last. Stay Hungry enough to pursue your dreams, and . . .
Stay Foolish enough to believe you will realize them ! This entry was posted in Accomplishing Objectives, Getting Inspired, Never Giving Up, Overcoming Loss, Staying Focused, Unconventional Means and tagged Apple, Pixar, Stanford, Steve Jobs. Bookmark the permalink.